An Israeli official says all 15 foreigners aboard an intercepted Gaza-bound ship will return home by the end of Wednesday. Interior Ministry spokeswoman Sabine Haddad said one person already has flown out. It wasn't immediately certain who had left. Passengers included activists from France, Sweden, Canada and Greece. There were also three journalists, including an Israeli, and several crew members. The lone Canadian on board was Stephan Corriveau of Montreal. 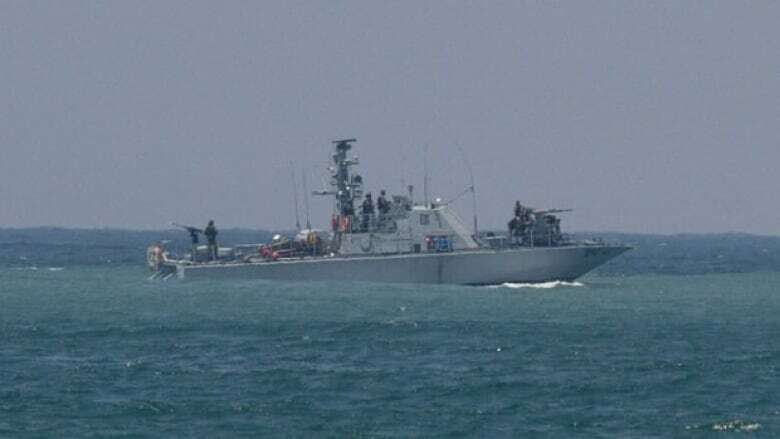 Israeli naval commandos took over the French boat on Tuesday to preserve Israel's sea blockade of Gaza. The military reported no resistance during the takeover. The takeover was the latest in a series of run-ins on the high seas between the Israeli navy and pro-Palestinian activists trying to breach the blockade. In the most contentious incident, nine Turkish activists were killed in a clash with Israeli commandos last year. Tuesday's operation at sea was far more subdued than the deadly clash last year. The navy intercepted the Dignity al-Karama some 65 kilometres off the coast and boarded the ship without incident after the crew ignored calls to change course. The ship was then towed to an Israeli port. The Dignity al-Karama was the only ship remaining from a larger protest flotilla that had hoped to sail weeks ago but was blocked by Greek authorities. In the past, there have been charges that Israel's seizure of boats on the high seas is piracy and contrary to international law. Israel claims it has the right to enforce a quarantine on Gaza to prevent weapons from reaching the territory's militant Hamas rulers, and many international law experts have backed up Israel's contention. A final UN report on last year's boarding of a Gaza-bound Turkish ship by Israeli commandos, which left nine activists dead, is expected to be released next week.